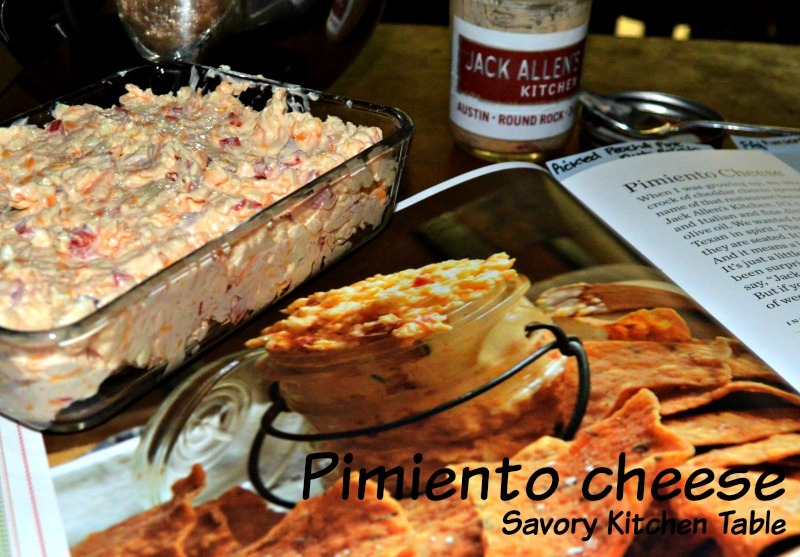 As a kid I hated Pimiento Cheese. What I didn't realize is what my family put out with crackers was NOT real food LOL. You know the jelly jar cheese spread you find at the grocery store. Jack Allen's Kitchen serves a small dab of their Pimiento Cheese with a cracker as a nibble before you order and it is fantastic! I even bought a jar to bring home and it was the first recipe I tried from their cook book when it arrived. At home we tried it with all sorts of crackers before deciding a simple Ritz cracker was the best. Mix together the cream cheese, mayonnaise, Worcestershire sauce, Vinegar and salt until smooth. Blend in the grated Monterey Jack cheese and grated Cheddar cheese. Fold in bell pepper until well distributed.